Recently, a friend suggested I start posting more about my secret obsession (not so secret anymore!) with natural skin and body care. The more I read about the harmful chemicals and preservatives we put in our skincare, the more I obsess about finding natural alternatives. The good news is that often you don’t have to look much further than your kitchen to find ingredients that really work and that are good for your skin, hair and body. Everyone’s body is different so what works for one person doesn’t always work for the next, but here are a few of the single ingredient items I keep stashed in my bathroom. Organic Extra Virgin Coconut Oil: Is there anything this oil doesn’t do? I absolutely love it as an all over body moisturizer, and perhaps my favorite use for it is as an eye makeup remover. More effective than anything else I have tried, coconut oil is excellent at dissolving even waterproof makeup. As a bonus, it adds extra moisture to your eyes and it smells delicious! Organic Raw Honey: Honey is antimicrobial and moisturizing so it makes a great cleanser. Ideally, you should rinse or wipe your makeup off and then gently massage the honey into your skin. You can let it sit for a few minutes or immediately wipe it off with a warm wet wash cloth. It is important to get raw organic honey because pasteurization kills all of the good bacteria in the honey. Argan Oil: I had heard a bunch of hype about the wonders of this oil for your skin and hair, and even bought a bottle of argan hair oil, only to be unimpressed by the fact that the oil was heavily diluted with fillers. The key is to get pure argan oil that has not been diluted by any fillers. It’s not cheap, but it will last you forever. I am in love with what it does to my hair. I drop 4-5 drops (less is more) in my hand and warm it in between my fingers. I then massage it into my hair, concentrating on the ends. It leaves my hair so much softer and less frizzy than it normally is. I also use it on my curly headed little peanut and it adds definition and softness to her curls. I also use this as the base for the face oil I am using currently. It’s a great choice for your face because it won’t clog your pores and absorbs quickly. Organic Raw Apple Cider Vinegar: Great for restoring the Ph balance to your skin and hair. In the summer, when my hair tends to be a bit oilier, I like to use it as a clarifying hair rinse. You can also use it as a toner for your skin by applying a few drops to a makeup pad and diluting it with water. Make sure that the vinegar you use is raw with the mother still in it because that is where all the good nourishing tidbits are. There you have it! 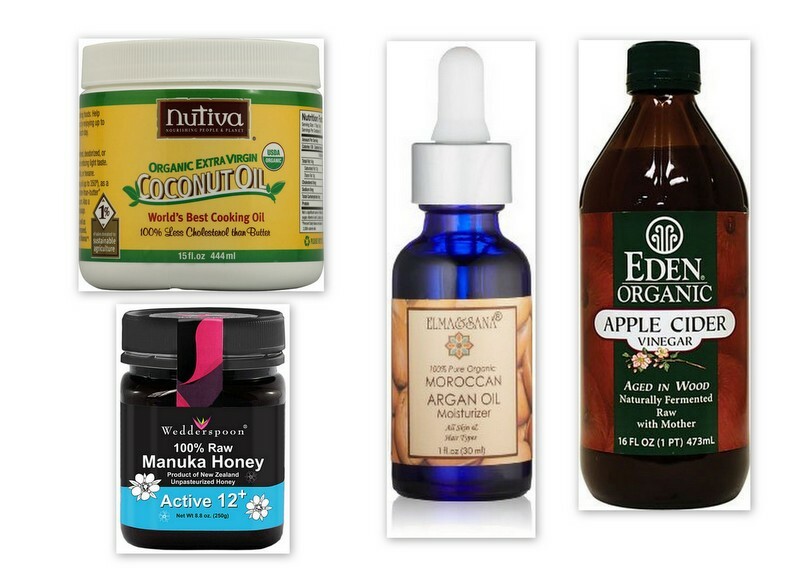 Have you tried any of these ingredients? What do you think? Also, I’d love to hear what you all think of these types of posts. Do you want to see more of them?